A long-studied archaeological site in a mountainous region between Europe and Asia was occupied by early humans as long as 1.85 million years ago, much earlier than the previous estimate of 1.7 million years ago, researchers report in Tuesday’s edition of Proceedings of the National Academy of Sciences. 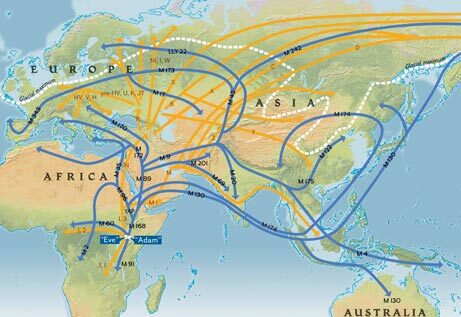 “The accumulating evidence from Eurasia is demonstrating increasingly old and primitive populations,” said Reid Ferring of the University of North Texas. Dmanisi is located in the Republic of Georgia. “The recently discovered data show that Dmanisi was occupied at the same time as, if not before, the first appearance of Homo erectus in east Africa,” the team led by Ferring and David Lordkipanidze of the Georgia National Museum reported. They uncovered more than 100 stone artifacts in deep layers at the site. Previously, fossil bones from a later period had been found at the site. The new discovery shows that the Caucasus region was inhabited by a sustained population, not just transitory colonists. “We do not know as yet what the first occupants looked like, but the implication is that they were similar to, or possibly even more primitive than those represented by Dmanisi’s fossils,” Ferring explained. The occupants of Dmanisi “are the first representatives of our own genus outside Africa, and they represent the most primitive population of the species Homo erectus known to date,” added Lordkipanidze. The geographic origins of H. erectus are still unknown. The early humans at Dmanisi “might be ancestral to all later H. erectus populations, which would suggest a Eurasian origin of H. erectus,” said Lordkipanidze. However, there’s another theory as well: H. erectus originated in Africa, and the Dmanisi group might represent its first migration out of Africa. But he stressed that’s a hypothesis which will be tested in future studies. “Possible does not equate with observable, but the Dmanisi evidence has forced us to have a good fresh look at some of our basic assumptions,” said Roebroeks. Not so sure of Ferring and Lordkipanidze’s theory is Richard Potts, director of the human origins program at the Smithsonian’s National Museum of Natural History. Michael D. Petraglia, co-director of the Centre for Asian Archaeology, Art & Culture at England’s University of Oxford, said the findings do show that early humans were present in Eurasia between 1.85 million and 1.78 million years ago. “The stone tool evidence represents the oldest and best documented case for the presence of early humans in Asia. This means that early forms of humans probably migrated out of Africa at or before 1.85 million years ago, or before, colonizing new regions of the world for the first time,” he said. But Petraglia added that he thinks the authors “are on less solid ground” with their suggestion that this early group may have migrated back to Africa.